January 11 2013, Guildford to Godalming via The Wey Navigations. 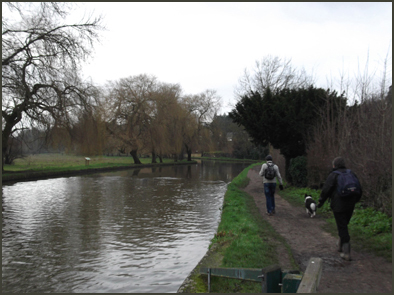 This Friday myself and three companions walked the towpath of the River Wey to Godalming. This section of the river being known as the Wey Navigations which is the name given to the part of the river that is navigable. 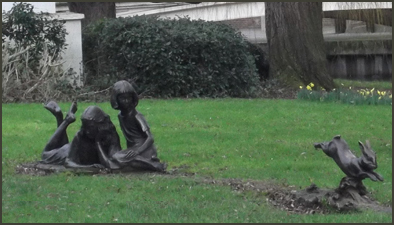 We began our walk at Millmead near the Yvonne Arnaud Theatre where we passed by the statue of Alice, her sister and the white rabbit made in memory of Lewis Carroll who lived the last year of his life in Guidford and is buried here. 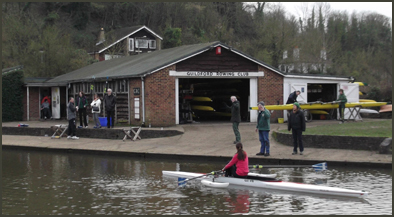 Just a few hundred yards into the walk we passed the Guildford Rowing Club where some of its lady members were out practicing. 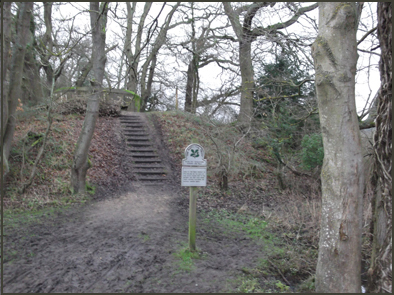 About a quarter of a mile further on we reached the bottom of Ferry Lane, named after the ferry that used to shuttle pilgrims across the river. 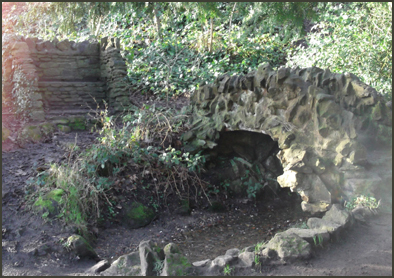 A Victorian grotto has been built around the narrow spring which emerges at the end of the lane. Our route took us passed a number of still functioning locks, proving that the river can be navigated by small craft, and under a railway bridge. We spied two old Pill Boxes, relics from World War Two and a reminder of a time not so long ago when Britain could have been invaded by the Nazis. 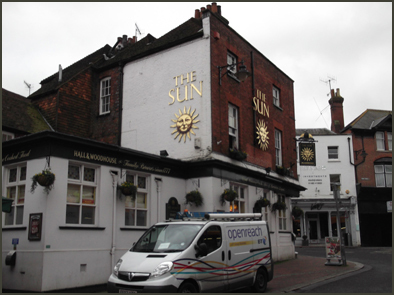 It took about two hours to reach Godalming where we stopped for a welcome lunch and pints of Badger Beer and Sussex Bitter at The Sun public house. It was a most hospitable pub and is highly recommended. The food was good, the beer well kept and the kind lady behind the bar provided a bowl of water for the dog.